You don't really think of Japan and good coffee as being synonymous. Before moving to Japan, I didn't have high hopes for a thriving bean scene here. But the coffee market is perhaps as surprising as the country in which it resides. A great example of this innovative marketing is the coffee industry’s android, “Pepper,” who has become the new global face of Nestle's Nespresso brand, nudging actor George Clooney out of the spokesperson running. Pepper enthusiastically sells coffee machines, asking you such questions as, “How do you enjoy coffee? Number one: An eye-opener coffee; Number two: A post-meal cup of coffee.” Will our android friends replace our favorite clerks at the local coffee shops some day in a Matrix-like coffee revolution? Only time will tell. With all this growth, the Japanese drink a lot of coffee, but people generally agree it’s not especially good coffee. Enter canned coffee from vending machines. Here's the deal: vending machines in Japan are AWESOME with a capital A. Did you run out the door, forgetting to drink your coffee in the morning? No problem-o. Just stop by a vending machine on every major corner for five seconds, and your day is saved! But here's the other deal: it's still not great coffee. Most of it is artificially sweetened and milky. It also gave me heartburn worse than a whole pizza ever could—not that I could even eat a whole pizza, but you get the point. I did a fair amount of experimenting myself, including the promisingly named “American Coffee.” I'm not sure what I expected, but it tasted just like any other Japanese canned coffee from vending machines: weak, milky, with an odd aftertaste. The tagline “authentic flavor of coffee” scared me, too. Why WOULDN'T it be authentic coffee flavor? It is coffee, right? Right?! I did manage to find a favorite that went down pretty smoothly, though. It might be in the name: Boss Silky Black. 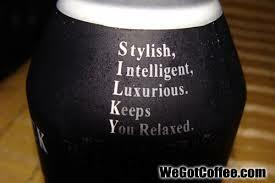 Once you go Silky Black, you never . . . well, you know where that goes. Or maybe in the manufacturer's insistence that it's "intelligent" and "stylish" while it "keeps you relaxed"? Almost like a perfect boy friend. Be sure to check 'em all out! Have experience with Japanese vending machines or coffee you’d like to share? Drop us a note in the Comments section below. Note: Colleen Luckett spent 3½ years living and teaching English in Japan until Spring 2017. She enjoyed writing about all things Japan on her blog, redheadinjapan.wordpress.com. What’s the Buzz on Most-caffeinated Drinks?